Hard Rock officials say the "Rhythem" typo was corrected by removing the extra vinyl letter. In a little more than two weeks, a new Hard Rock Hotel and Casino will open at the former Taj Mahal in Atlantic City, New Jersey. The newly-renovated property will also be home to historic musical memorabilia. Check out our inside look at the musical artifacts that are currently being held at the Rock Vault in Orlando, Florida. 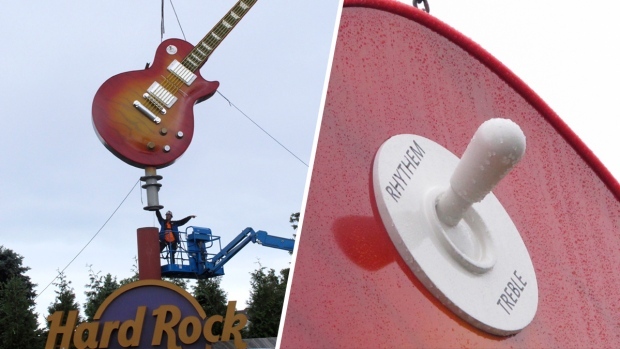 The soon-to-open Hard Rock Hotel & Casino in Atlantic City, New Jersey, had to work quickly to fix a misspelling on a 30-foot-tall guitar installed this week.